1. You are an investor in our nation and your tax dollars come back to your community. Your taxes fund health care programs, clean drinking water, education, the national weather service, highways and bridges, and national parks, among many other things. Federal dollars flow into your state and then down into your own neighborhood. Across the nation, about 30 percent of state revenues come from the federal government. To see how federal money impacts your state, visit State Smart. 2. You pay the federal government’s bills. Around 80 percent of all federal tax revenue comes from the paychecks of Americans, through income taxes and payroll taxes. Almost half of all federal revenues come from individual income taxes: taxes you pay on income from work, investments, and more. Income taxes are what the April 15 Tax Day is all about. 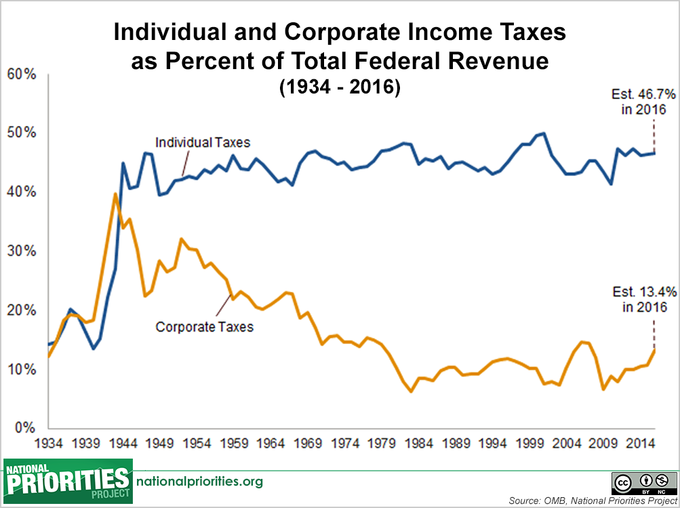 Additionally, about one third of all federal revenues come from payroll taxes that pay for programs like Social Security and Medicare, and may show up on your paycheck as “FICA.” Corporate income taxes make up only about 11 percent of federal revenue, down from a high of almost 40 percent in 1943. That means regular people like you are the primary bill payer for the U.S. government – and that’s why the federal budget belongs to you and to all Americans. 3. 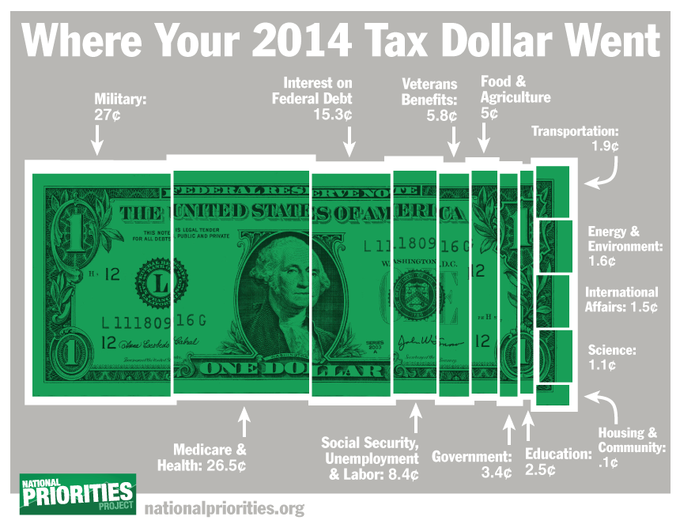 Where did your 2014 income taxes go? Want a personalized tax receipt based on taxes you paid for 2014, including how much you paid for programs like SNAP (food stamps), nuclear weapons or renewable energy? Visit our tax receipt. You can also see the average tax receipt for taxpayers in your own state. Ten of the largest tax breaks that together totaled more than $750 billion in tax savings in 2013 overwhelmingly benefited the top 1 percent of households, with 17 percent of the benefits going to those top earners. That’s in part because tax deductions – one important type of tax break – are far more likely to benefit the wealthy than middle- and low-income folks, because deductions only offer savings to taxpayers who itemize deductions on their tax return. Only 16 percent of households making between $25,000 and $30,000 itemize tax deductions, while nearly 100 percent of those making over $200,000 do. To learn more about tax breaks, check out our interactive tax break analysis. 6. But, some tax breaks go straight to working families. Most tax credits are “nonrefundable”, meaning it is possible for them to reduce your taxes down to zero, but they can’t also result in the Treasury sending you a check on top of that. But a couple of tax credits are “refundable,” meaning after your taxes have been reduced to zero, you still may get a check. The Earned Income Tax Credit (EITC) and the Child Tax Credit (CTC) are refundable, and are widely seen as effective anti-poverty measures, helping to combat inequality. While such measures alone won’t eradicate inequality, they’re important – and widely supported – tools in the fight against inequality. 7. Tax breaks as designed are often inefficient. Lawmakers often use the tax code to achieve goals like promoting manufacturing or reducing the cost of health care. But the tax code isn’t always effective at achieving these kinds of goals. For instance, Washington devotes billions in spending to financial aid for college students, while a variety of tax breaks do the same thing. But while Pell grants and other direct aid are largely effective at reaching low-income students, tax breaks are far more likely to reach wealthy families who may be less in need of aid. U.S. Census Bureau, State Government Finances. NPP analysis of OMB Public Budget Database. Jeannette Wicks-Lim, Political Economy Research Institute, “EITC and Minimum Wage: We need both to make work pay”. For a list of education tax breaks, see Tax Day 2015: Notes & Sources.